CensiMark is the preferred marking method for nearly 450 facilities nationwide. This unique, electro-chemical marking process (ECMP) applies a 2-D mark to the instrument without altering the surface. CensiMark also offers a comprehensive marking service to commission your entire surgical instrument inventory to your instrument tracking software. See the chart below comparing the different marking methods and what sets ECMP apart from the rest. The common methods of marking include ECMP, laser etching, dot peen, engraving, and mechanical labeling like KeyDot and surgical tape. Figuring out which one is right for you requires you to consider a few things like durability, size of mark, risk of bo-burden buildup, corrosion resistance, and cost. This chart compares many of these factors to help you decide which one is right for you. After years of utilizing laser etching, our team here at Censis moved to ECMP to begin offering a mark that has no risk of bio-burden buildup and no physical change or damage to the instrument’s surface. We even offer two different sizes of marks, so that CensiMark can be applied to all different types of assets, including flexible scopes, neurosurgery, and cardiovascular instruments. But we don’t stop at providing an industry leading mark, we also offer a comprehensive instrument marking service. Our marking service provides a committed team of experienced industry professionals that arrive on site to mark the maximum number of instruments at a facility with minimum disruption to daily workflow. After we mark all of the instruments, we also then commission those instruments to your instrument tracking system, which will also ensure you’re prepared for the unique device identification initiative. 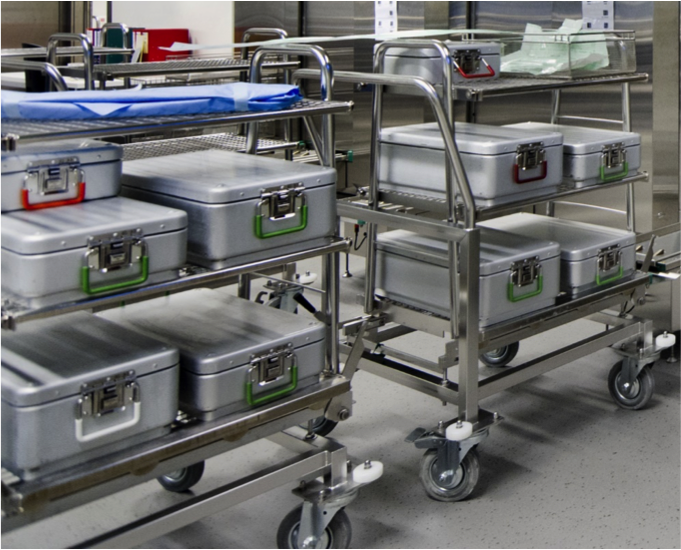 It is not unusual for surgical assets to “migrate” from tray to tray as they move through the reprocessing loop. The use of electronic count sheets helps with documentation and provides easy access to assembly instructions, and acceptable substitutions, but adding the ability to “scan” assets during the assembly process can dramatically impact tray accuracy and technician efficiency. The combination of the CensiTrac software with the CensiMark solution helps to ensure instrument sets have the precise instrument type and quantities required for a specific configuration by alerting the user if items do not belong or if the quantity has been met. Using the CensiMark solution to mark and identify surgical assets means that the last scanned location of every individual marked asset, (including but not limited to instruments, peel packs, and endoscopes) is tracked. Having individual asset location information in just a few clicks enables facilities to find assets, or determine when assets have gone missing in a much more efficient and effective manner. It makes sense that it is more cost effective to send instrumentation out for maintenance based on number of uses, rather than sending items out on a schedule, whether maintenance is due or not. Combining the CensiMark solution with the CensiTrac system allows the software to track the number of times an individual instrument goes through the reprocessing loop. By alerting staff assembling trays when maintenance is due on an individual asset based on actual usage, facilities are able to reduce annual maintenance costs. Instrument-level tracking is the only way to truly track every single instrument to each patient and get the biggest return on investment from your tracking solution. That’s why instruments marked with unique device identification directly impact patient safety and positive patient outcomes because they are the key to enabling instrument-level tracking. Without marked instruments, instrument-level tracking is impossible.